The top communications regulator won support to pass contentious new rules for Internet traffic, a move likely to face legal challenges and create uncertainty about Internet regulation. The Federal Communications Commission is set to approve on Tuesday Chairman Julius Genachowski’s proposed rules governing net neutrality—a concept aimed at preventing Internet providers from interfering with web traffic. The rules are expected to bar providers from discriminating against legal Internet traffic and require more transparency. They also would let broadband providers for the first time charge more to companies that want faster service for delivery of games, videos or other services. 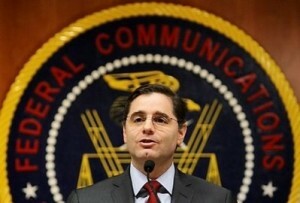 “We must take action to protect consumers against price hikes and closed access to the Internet—and our proposed framework is designed to do just that: to guard against these risks while recognizing the legitimate needs and interests of broadband providers,” FCC Chairman Julius Genachowski said in a blog post this month. The proposal has split the five-member FCC board. The two Republican members say the proposed rules impose an unneeded burden and will discourage broadband investment. Mr. Genachowski’s two Democratic colleagues said his plan didn’t go far enough, particularly on rules covering wireless networks, but agreed to back it anyway. The proposed rules are expected to provide some new protections for consumers, such as a guarantee that they can access legal websites, and require providers to give more data on Internet speeds and service. The rules include fewer restrictions on wireless broadband networks. Mr. Genachowski’s proposal has drawn mixed reaction from industry, advocacy groups and members of Congress. For the most part, phone and cable companies have said they didn’t want new rules on Internet lines. But they have mostly backed AT&T Inc.’s push to compromise with Mr. Genachowski. “The chairman seems more willing to work with the companies he’s supposed to be regulating than his fellow commissioners at the FCC,” said Joel Kelsey, political advisor for Free Press, a public advocacy group. Republicans are vowing a fight. Sen. Kay Bailey Hutchison (R., Texas) wants to cut off FCC funding to enforce the rules. House GOP lawmakers plan hearings and legislation to overturn the FCC’s planned rules. The rules are also expected to be challenged in court. Similar rules proposed by the agency in 2005 were thrown out by a federal appeals court in April. In April, a federal appeals court tossed the FCC’s first effort to enforce net neutrality rules, saying the agency hadn’t justified its authority to act. The current proposal is expected to use a similar argument to the one used in the April case. In May, the FCC’s general counsel said using a variation on the same argument was “a recipe for prolonged uncertainty” but FCC lawyers now say upon further consideration, they believe their plan will withstand challenge. The only reason the US Government or any other Government wants to control the Internet is to prevent anti-government activities. None of those at the upper levels are interested in making the Internet or anything else family friendly. They are the same people who are forcing the homosexual agenda on school children. They are frightened of WiliLeaks and all similar activities. All Governments have what to hide and most of the people involved in running Governments are corrupt degenerates who do not want to be exposed. The Internet is very frightening to such people. It only takes one person with access to expose the crimes of a Government to Billions of people and it can happen in the matter of milliseconds. Can someone explain this in layman’s terms? If the senator from Minnesota can’t figure out if good things are happening or bad things, how am I supposed to?